Out with the old, in with the new! My spunky three year old has officially outgrown her crib and is sleeping in a Big Girl Bed– and I have to say, I’m pretty obsessed with it. To be clear, since Marlowe turned two she had been sleeping in her crib which had been converted in to a “Toddler Bed”: one side of the crib was totally off, and she was able to get in and out of it independently. But it was still a crib! The transition to this Toddler Bed was a little hairy. I liken it a bit to Sleep Training (if you’ve ever done that). I really had to set the boundaries with Marlowe, remind of the plan, and focus on follow through. It took Lowie about four days to feel comfortable sleeping in her Toddler Bed without crying out for me or Kyle until she fell asleep (and a couple of times during the night.) I mean it’s crazy what taking one side off of a crib can do to a kid emotionally! Thankfully, Marlowe was great at sleeping in her Toddler Bed after the initial transition, but I was a little nervous when I knew we were going to be switching up her sleeping situation again with the Big Girl Bed when she turned three. First thing first: we had to choose her Big Girl Bed! I absolutely swooned over this Incy Interiors twin bed. I wanted to stick with a white wood vibe, and I completely fell for the adorable bed frame that almost looks like a bunch of bubbles stacked up! 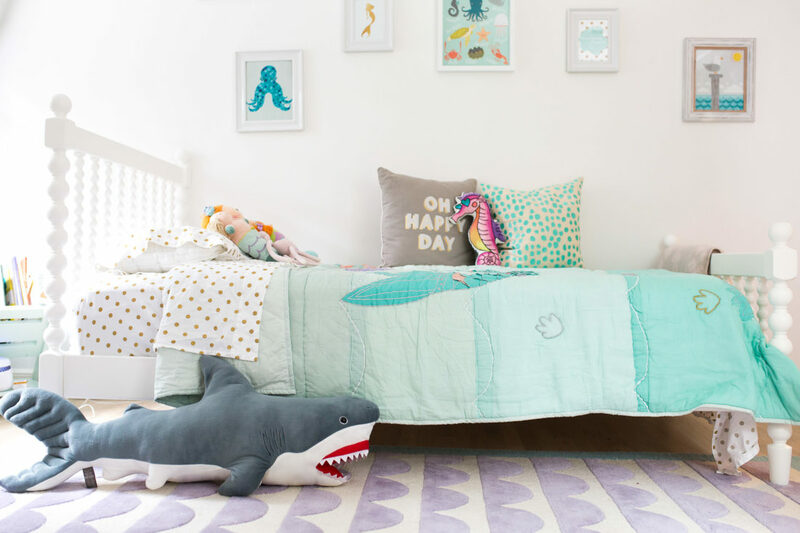 It goes perfectly in her Mermaid-themed bedroom. I was also so excited that I got to pick out a new quilt! 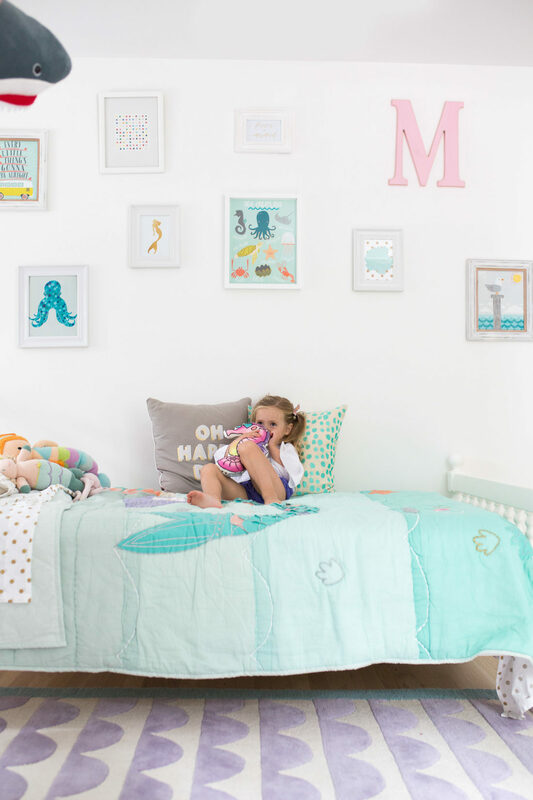 Land of Nod always has the cutest Mermaid pieces, and I fell in love with a gorgeous Mermaid quilt to make her new bed even more special! Marlowe is obsessed with her new bed setup– especially the fact that she has so much more room for visitors. Her big thing now is letting us know that her bed is big enough for Mama AND Daddy AND Major Boy to snuggle her all at the same time! It’s so sweet to me that that is the main draw for this new bed situation. Ha! Because Marlowe had actually managed to roll out of her Toddler Bed a couple of times in the past year and ended up on the floor, I also added a little guard rail when she started sleeping in it. I was expecting a bit of a transition time when we implemented Operation Big Girl Bed, but truthfully, I think she was relieved to finally be in a bed that’s more her size. She had definitely outgrown the crib mattress. 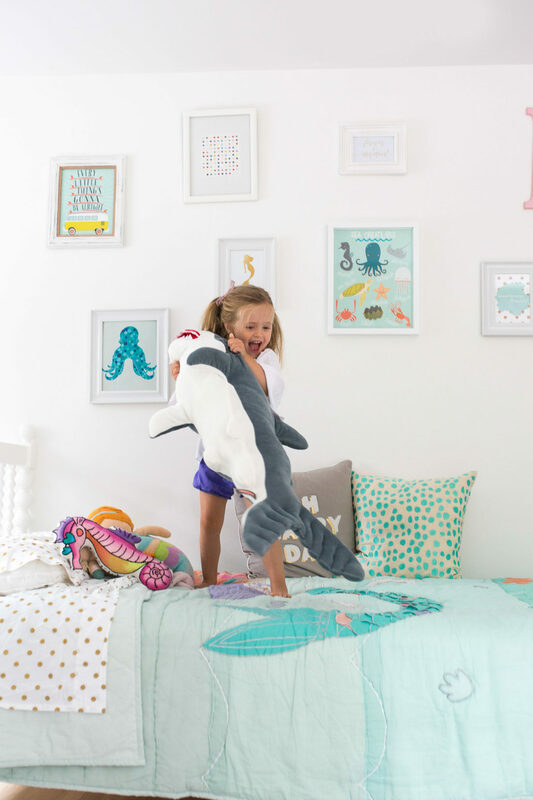 The first night, she wanted a few more snuggles at bed time– but we talked a lot about how cool it was that she had room for even MORE stuffed animals to keep her company while she slept in her Big Girl Bed! I left her room and closed the door expecting to hear some yelling for me in a few minutes, but after a half an hour all was still quiet. I peeked in to check on her and she was fast asleep on her new big girl pillow, with all her stuffed animals around her. That next morning she even slept in until 8am! Take the emotional change in to consideration! 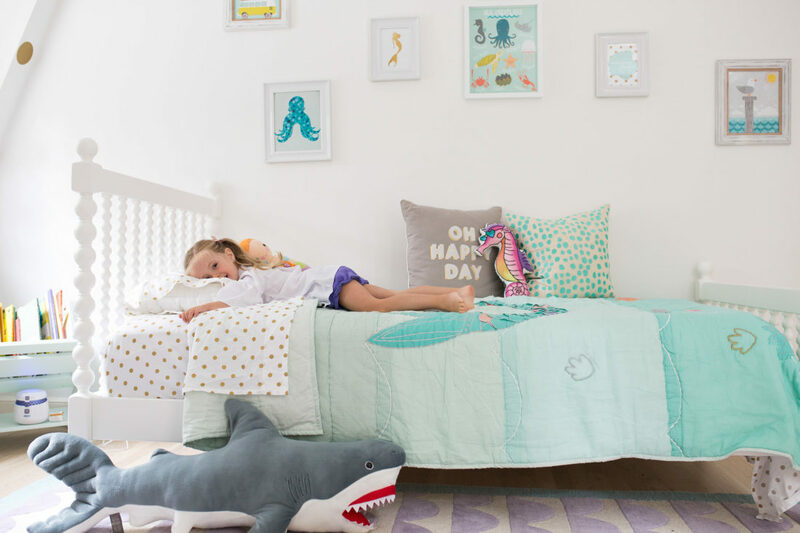 Even though it seems exciting to us, a change with a kid’s sleeping arrangement can leave them feeling super emotional. I always ask a lot of questions about feelings during these big transitional moments and make sure I’m paying attention to any changes in behavior that might represent signs that Marlowe needs me to hold her hand a bit more through them. Get a Toddler Alarm Clock. This thing has saved my life. 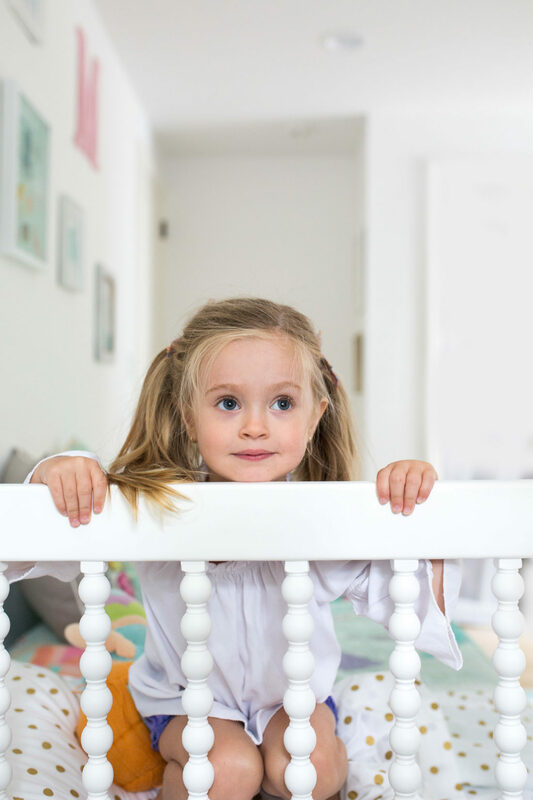 The second your child can get out of their bed by themselves, they can get out in to the hallway just as easily– and in to your room! This doesn’t lead to much sleep for anyone. Before we took the side off of Marlowe’s crib, we trained her with a Toddler Alarm Clock. The stoplight changes from red to green at a predetermined time (by you) and let’s your child know when “Morning time” is and they can get out of bed. It took us about a week for her to get used to it, but it really works like a charm! Marlowe’s clock is set for 7:30am, and she knows that until her light turns green she MUST stay in her bed. Play up the Cool Factor. Kids get excited about anything you’re really excited about. When we transitioned Marlowe out of her crib we went crazy playing up how cool it was to be graduating out of a crib. We did a countdown calendar of when we would do it, and even gave her a little gift on the day to represent how proud of her we were that she was so big now! Celebrate the change. Is your kid’s new bed big enough to get in some good snuggles with Mom and/or Dad? Take advantage! As we all know, change can be emotional but it can be fun too! Don’t forget to let loose a little and celebrate this fun new stage with your child! Yay everyone! Both my kids slept better in big kid beds than their cribs! It is just a different page of sleep training in my book. And I’ve had to re-solidify the boundaries periodically when a change in schedule happens(vacation, illness, etc). And lots of stuffies is a must, makes a big bed feel smaller! We recently moved and I made the mistake of leaving her crib and upgrading her at the same time. We are almost at 3 months and she still gets out of bed every night. We just got the toddler clock at the suggestion of our doctor. Praying for Amazon Prime and this clock. Sleep deprivation is no joke! I’m adding your tips to review tonight as well. Thank you! We just moved as well and kept the old crib mattress on the floor right next to the new big boy bed sonhey were touching (we didn’t have the bed frame yet). It worked well for us because our 3 year old could lay on either- over about a weeks time. At first he chose the crib mattress but eventually loved the bigger mattress. We enticed him with stuffed animals and fun new sheets. One day the crib mattress went to another family so we told him he didn’t need it any more, that he was a BIG boy now and he’s never looked back. He’s very sensitive too so we were really pleased he took it so well with minimal stress on everyone! We are in the exact same boat! Son turns 2 in September, Baby #2 due in October. We had thought we had a good plan, which was to leave son in crib until we were ready to have baby out of our room. Our son was in our room until he was 8 months, so we thought we had plenty of time to work with him on the bed transition. And then…last night he climbed out. 🙁 Back to the drawing board! I have read/heard so much about not doing any huge changes for toddlers for 6 weeks prior to and 6 weeks post-big changes, including new babies and moves. So we’ve got like 2.5 weeks to decide! Good luck! Yay congrats! Having been through both things, I recommend transitioning her now before baby comes. You will NOT be in the mood with a newborn. Trust me! It won’t take her as long to get acclimated as you fear. Good luck! The Hatch baby light is also amazing and you can set programs on your phone!!!! Amazing and does sound and other neat colored lights. The light is also great when you’re still doing a night feeding in the early months because it provides a small amount of light, but won’t confuse kids into thinking it’s morning. In other words the price is worth it and it’s BEAUTIFUL! 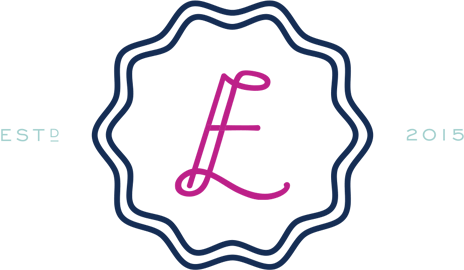 So timely….we just transitioned our 3 year old boy into his toddler bed (by removing the side of his convertible crib) and it has been a disaster. I thought things would run as smoothly as it did with his 5 year old sister, but no such luck. He gets up, throws all his clothes in the hallway, and removes his pull-up. I’m pretty much back to baby proofing his room and resorting to putting the rail back up. It is definitely a work in progress, but some of your tips should work. Thank you! Since my daughter started crawling out of her crib in January she hasn’t slept through the night. I know it’s a terribly long time but we went through a series of illnesses which made it hard for me to stand my ground. Now we’re looking at big girl beds as an exciting change and she just saw this post and said she wants Marlowe’s bed. I was thinking the Jenny Lind but I also really like this one! She’s going to be 3 in a few weeks and our daughters remind me so much of each other. We are in the process of buying our little ones big boy bed and all the accessories for it. What mattress did you get for Marlowe? I am overwhelmed by all the choices and can not decide on one! 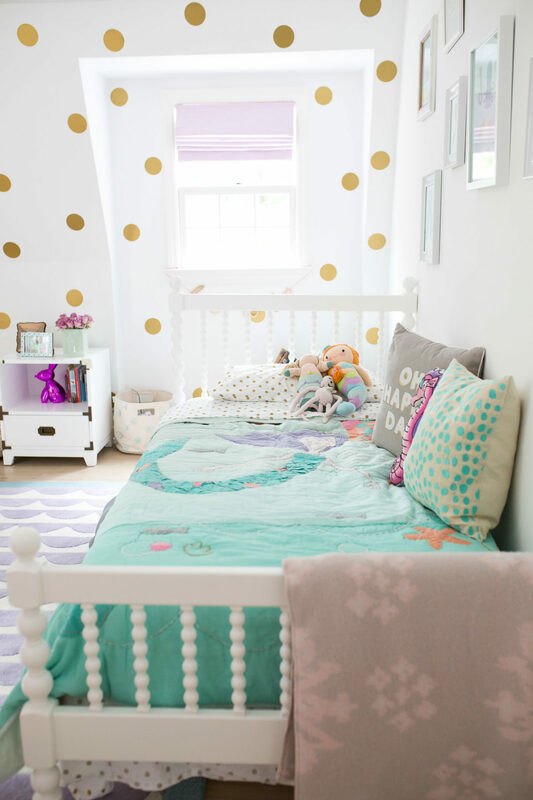 Her room is absolutely adorable! Hi Eva! On your InstaStories, I see some guard rails on Marlowe’s bed that you’ve installed to help keep her a little more confined, and prevent her from rolling out of the bed. Can you please tell me what brand they are? Going to transition my 3 year old son to a bed soon too and will definitely need these. Thanks!